Is Private Label Merchandise Right for Your Retail Store? Products which are generally manufactured or provided by one company, then labeled with another company's brand, are known as private-label products. Sometimes referred to as OEM (Original Equipment Manufacturer) products, these items can generate a profitable revenue stream for your store and, if done right, can give your store not only additional product lines to sell but also an enhanced degree of credibility and trust with shoppers. Chances are, you have bought a private-label product sometime in your life. It could've been a grocery-store-branded bottle of ketchup, pill medication from your pharmacy or a shirt from Target. People have become very comfortable with private labels and generic-brand items, and stores have become more sophisticated in how they present their own private-labeled product lines. If you, as a business owner, have considered offering a line of private-labeled merchandise, it helps to become more familiar with the pros and cons as you work through the process. Increased Margins: Typically, since you are bypassing the brand name on a private-labeled product, there is no added cost for the vendor. Vendors must spend money to promoted branded products, but you pay only the product cost without paying a premium for the brand name or the expensive marketing campaign that goes with it. Reduced Competition: If you are a retailer who matches prices, private-labeled goods provide a great benefit. In many cases, you can get your supplier to make you the same product, but without their label on it. Then you can still charge full price for your product when your competition puts the branded version on sale. You also have full control, depending on your supplier, to alter the product to address any customer complaints or issues. Brand Builder: With your own products, you can build your brand. For example, if you own a shoe store, you could create your own store labels for items like shoe polish, shoe trees, and shoe cleaner. You would purchase the products without labels and then attached your own when they come in the store, or buy the products from a manufacturer or wholesaler who can apply custom-designed labels for you. You can design your own, or many contract manufacturers also have in-house art departments that can create exactly what you need. Compensation Booster: As a business owner, you can run sales contests on your private label products, because they have more profit margin, allowing you to give more money to your sales team. Even after paying out the incentives, you'll likely earn more money than the branded-product version, because of you'll pay less for private-labeled products, while being able to sell them at or around the same price as comparable branded products. 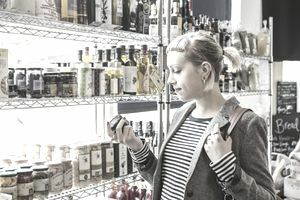 Customer Loyalty: If the customer loves your private-label products, they will want more, and the only place they can purchase them is in your store. In a retail world where loyalty isn't as prevalent anymore, this is one way to keep your customers returning time and again. Dead Inventory: If you order a line of private-label products before analyzing your customers' needs, you could make a bad product choice and then have a hard time selling through your inventory. With branded merchandise, you can get a return authorization, but you won't be able to return private-label goods and might have to reduce the prices drastically to move the units out if customers aren't embracing them. Minimum Orders: Most manufacturers require a minimum quantity for each order before they will consider customizing items to fit your private-label requirements. Often, this is a much larger quantity than you would normally buy of any one item or SKU. Try to work with the vendor and be creative when ordering, and see if you can get some extended dating on the purchase, or meet the minimum purchase with different colors or sizes of the same item. Customer Perception: Some customers assume that private label products are of lesser quality than products from a brand name of which they're familiar. Perform in-depth research on your customers, their likes and preferences, and create a name and look for your private-label line that matches the level of quality your customers desire, and that's also comparable with more familiar branded product lines you offer. Private label merchandise can be a great benefit for your store, as long as you are aware of the risks. Start slow, and ease into it by testing with one or two products versus a whole line of items. For your first few products, take notice of which branded items are your best sellers. For example, if you sell a lot of a mainstream-branded lavender soap that's wrapped in beautiful gift paper, find a supplier who can create a similar item, add your own twist to the design such as added ribbon, or make it a two-pack, and have a label created with your own unique brand. Depending on your relationship with the branded-soap vendor, you could place your soap alongside the branded product and charge slightly less, or you might need to place your private-label product in a different area of your store. There are still many customers who prefer the familiarity of brand-name items, and big brands spend millions of dollars to convince consumers that their brand is better than a generic or private label. It pays to be careful and conservative when creating your own line, but the potential has no limit.